We have all the garage parts you need! Garage door problems are generally rooted in a faulty part, which puts strain on a system. A damaged torsion spring can invalidate your entire counterbalance system, just like a faulty logic board can make your opener behave erratically. Solving garage door problems starts with figuring out which part isn’t pulling its weight. We stock a wide range of essential garage door parts, to ensure a quick replacement when your door breaks down. 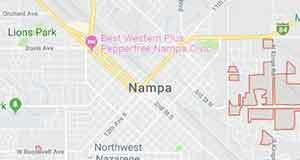 Our selection of garage door parts in Nampa, ID are all OEM parts and come backed by the best warranty in the industry. We’ll make sure you get a seamless replacement that restores efficient function to your door. Few things are more frustrating than a garage door opener that opens sometimes and doesn’t work other times. When it comes to faulty garage door openers in Nampa, ID, we’ve got the parts and components to repair your opener and make sure it works perfectly each and every time. Because we stock parts and have them on-hand, you can rest assured you’re getting reliable repairs fast. Contact Haney Door Service today at 208-466-3543 and let us provide the parts you need for peace of mind and a garage door that works flawlessly.